Last month, sorry I forgot the exact date, I became a godfather again and it was a first time to be a godfather to a baby girl. But this is the second time that my bestfriend and I became a "MAGKUMPARE". 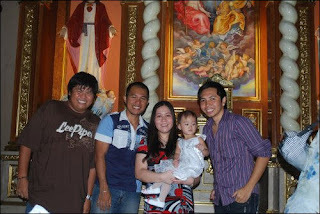 The Christening ceremony was held in Pasig Cathedral and take note, I was late kahit sobrang lapit lang sa amin ng simbahan... hehehe... Anyway the name of the child is Psyche Violet, such a unique name. The ceremony went smoothly and umabot ako sa part ng "pagbibinyag". Besides from Best, I was also with Obesefriend and April (can anyone help me giving a friend name for April? hehehe). Breast failed to show up as according to her, she had an appointment with her dentist. 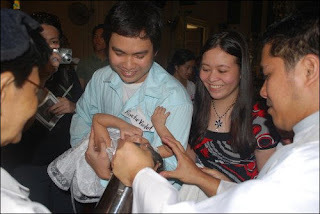 After the Christening process, Best became an official photographer again! Hehehe... See his shots on this link. Afterwards, we saw JM and Melai and we headed together to the reception (un ba tawag dun? ung kainan after ng binyag? hehehe...). The reception was in Chowking San Joaquin - Pasig. In that place, I saw other classmates and schoolmates! We enjoyed the day celebrating Christian life for Psyche Violet.